Good “almost” Valentine’s Day to you all. Creating a message of love for someone that is dear to you takes that message to an entirely new level. Your message becomes a keepsake that your loved one will treasure for many years to come and possibly if your loved ones are like my husband …. it’ll be cherished forever! You can spend hours on a handmade card or you can use extraordinary products to make it look like you spent hours. “Painting with glitter” is a simple, fun technique that always takes a card to the next level. You can do the whole card as a “glitter painting” OR you can simply add a glitter, painted embellishment. In the spring issue of “Canadian Scrapbooker” 2011 I shared this technique in my “It’s All About Rubber” article. Since then our publication has gone international and therefore the name of this wonderful magazine became “Creative Scrapbooker”. If you like so many of us have collected this magazine and have created a “resource library” with your issues you will have access to this article on page 108 to page 112, all beautifully stepped out for you. I have created a “simple step out, photographically” to show you just how easy the basic technique is (just in case you do not have this issue) and then you will see that I “ran with the idea” and created layers of beautiful, glitter-painted images to create unique Valentine cards for my loved ones. Apply to Be Creative tape to a piece of window plastic. Create a window template using a piece of just the “backing” from Be Creative tape. Make the window slightly smaller than your stencil by tracing the outline of the stencil with a Sharpie and then cutting inside the “traced window” as shown. 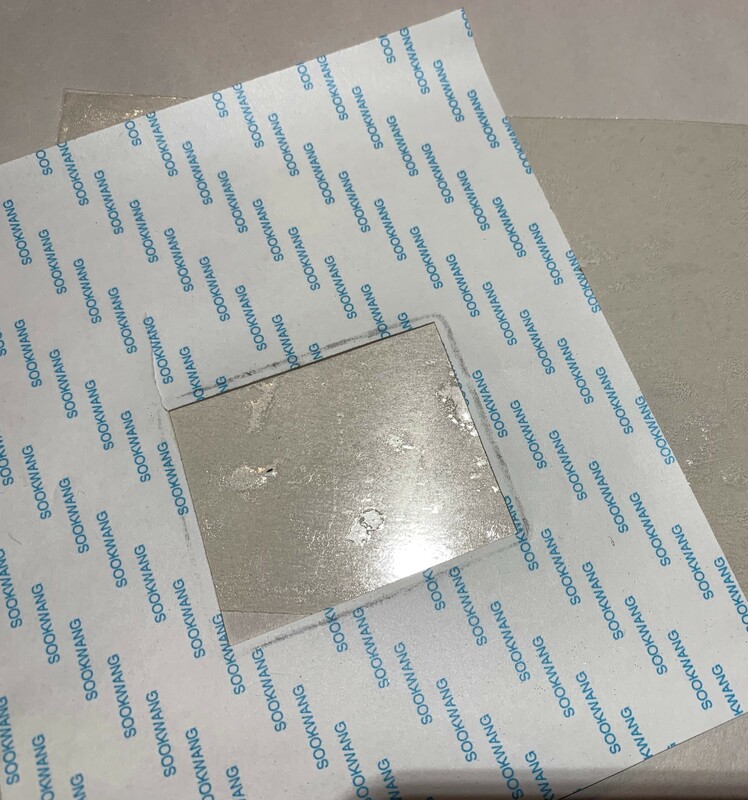 Place this window template on your prepared piece of window plastic where you want to see your image. Rub an “olive oil” soap on the back of your stencil, brush away bits of soap from both sides and after placing on top of the window prepared in step 2 add you glitter using a “straw scoop” that is ever so easy to make. Apply the glitter in small amounts and gently burnish with a painting stub. Carefully brush away any excess glitter and then turn the piece over and pull the “altered window plastic” from the stencil …. DO NOT pull the stencil from the altered window plastic, that has the Be Creative tape attached to it. If you do it that way your chances of ruining your stencil are high. Repeat for a second image on your “window plastic”. Pour “Sugar Beads” from Be Creative over all the rest of the exposed adhesive. Do this in a tray or you will have beads EVERYWHERE, lol! This has been done using …. Yes! brass or stainless steel stencils from Dreamweaver that are now available thru Stampendous. One of my backgrounds was done using the polka dot stamp, background from Impression Obsession and it was stamped using Clearsnap ColorBox, black pigment ink in my Cathie Allan, position-it 2 by Ecstasy Crafts Sometimes as you see in the photo when I am stamping a large, very solid image like this one, I will place my “Position-it” on the floor and use the pads of my foot to apply pressure. Because my cardstock is SECURELY taped to the baseboard with removable tape nothing moves and this truly helps me get that perfect image. My 3D embossing folder that came from Crafter’s Companion was lightly buffed (think dry brushed) with Clearsnap ColorBox, gold, and Chianti, pigment ink using a stylus and a foam tip. Apply ever so lightly so that just the high points of the embossed panel were altered. There are endless variations to this super fun, super easy, super sparkly technique that is so timeless and so versatile. 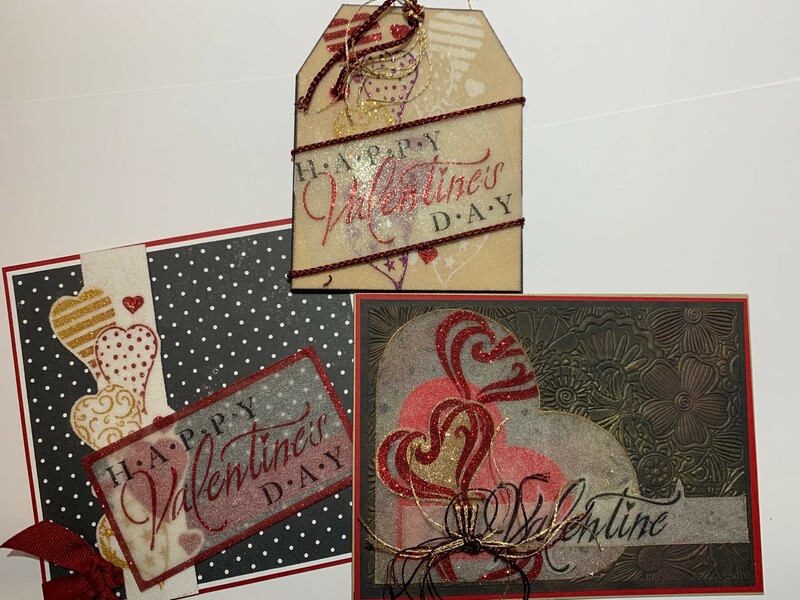 Watch for these variations coming up in my future articles in Creative Scrapbooker. AND remember to store them like a beautiful resource book on your shelf as Creative Scrapbooker magazine, truly has the look and feel of a “book”! HAPPY VALENTINES EVERYONE …. Spoil ALL your loved ones. What a great technique, and I do have a llarge amount of brass stencils. Now what if you dont have olive soap? What could I use instead? Wow! What an array of items to be won! I love your art work and the pix and explanations. Inspiring! So now I’m off to put said the numerous items that I could use to make the final card!